The bus, returning from Kondagattu to Jagital, skidded off the ghat road near Shanivarapet village and fell into the valley resulting in the accident, they said. 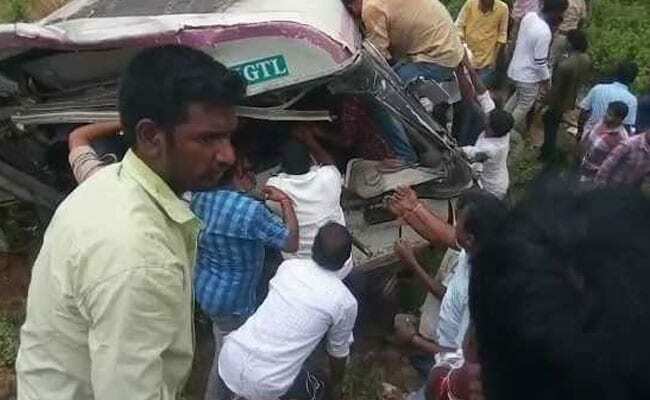 At least 15 passengers died and 20 others were injured after a state-owned Road Transport Corporation bus fell into a valley in Telangana's Jagtial district on Tuesday, officials said. The bus, returning from Kondagattu to Jagtial, skidded off the ghat road near Shanivarapet village and fell into the valley resulting in the accident, they said. Over 40 passengers were travelling in the bus. "The incident happened between 11.45 am and noon. At least 15 persons have died in the mishap...20 others were injured and they have been shifted to different hospitals," Jagtial District Collector A Sharat, who is supervising the relief and rescue work, told PTI over phone.